HOW DO I PURCHASE MY PASS? WHY SHOULD I RESERVE MY SPOT IN A CLASS? In the event of an emergency and need to notify students in a class (i.e. emergency cancellations due to weather or other circumstances), we can contact you directly. If you don't reserve your spot, you may miss those important notices. It helps us balance male/female ratio where needed/possible. Where space is limited, we'll accept students who reserve classes in the order that they are reserved. HOW DO I RESERVE MY SPOT IN A CLASS? Click on the the classes below (in blue) to reserve your spot in that class. No. Partners are not required to join a class! Many students come without a partner and meet new people in class! So, you can come on your own, with friends, co-workers... just be ready to have a great time! Applies to Level 2+ and Specialty classes. Purchase a 5-Class Pass, 10-Class pass or Membership to join a class. To sign up for a class, you must first have a valid pass. **See instructions below on how to sign up for a class. While some classes specify a specific start and end date, most classes are going unless otherwise stated. When you pass is about to expire, you will receive an email to remind you to purchase a new pass. For details about each pass type visit the Pricing page. No Forgot your password? No problem, you can reset it easily! Click here to access the log-in screen. 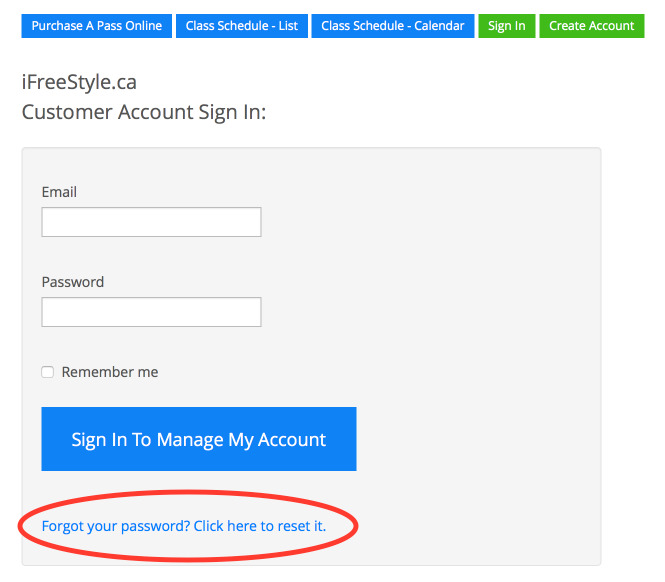 At the bottom of the page, click on "Forgot your password? Click here to reset it".